I have a DHT11 sensor for temperature and humidity. I want the AC to turn on when the temperature is greater than 30°C, and off when it's less than 20°C. Same for the humidifier: on (humidity < 50 ) and off (humidity > 90 ). It's not necessary for both to operate at the same time, i.e first check for AC then humidifier. I want to do this task using a single Arduino Uno. Connect both of your appliances i.e AC and Humidifier to 2 different relays. 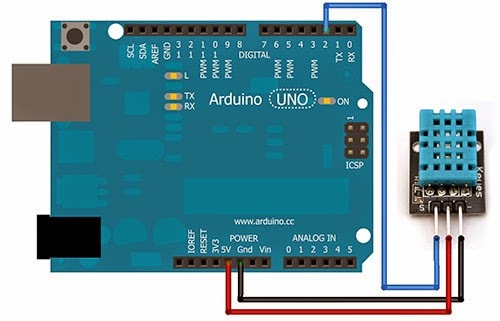 Connect the relays to the Arduino Uno digital I/O pin using a small current amplifier circuit or a Darlington Transistor pair that will amplify the current going to the relay. Now the connection of your sensor with arduino. In your code you have to use DHT library i.e. You can the similar code to control your relay according to the temperature and humidity here. Simply first check the AC temperature and switch on/off the AC relay and then check the Humidifier humidity and switch on/off the humidifier relay. You should use two relays to operate the two devices. You would have been able to use one relay, if you would have one device ON or OFF by default. For the relays use separate I/O pins declared as OUTPUT and have some circuitry for Arduino output current to be amplified, before the relays and after the I/O pins. Not the answer you're looking for? Browse other questions tagged arduino-uno i2c temperature-sensor modbus can-bus or ask your own question. DHT11 Sensor : Stand-by or Shut down?